The multi-state system (MSS) reliability has developed as a natural extension of classical binary-state reliability. The conventional methods of binary state system reliability become cumbersome if they are used for the analysis of MSS. 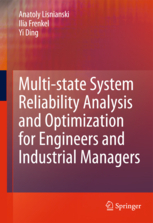 The first author of this book, it appears was the first to author a book on MSS reliability, which was published by World Scientific in 2003 in association with another coauthor, Dr. G. Levitin (a well-known researcher and engineer of Israel Electric Corporation). The present book begins with the introduction of MSSs and their basic properties. Several real life examples are cited to illustrate the MSSs. The authors of the present book claim that this is the second book to be published on MSS. Therefore, the book reviews, as is evident from the Table of Contents given above, the developments that have taken place during the intervening period of seven years. New topics that find place in the book over the earlier book by Lisnianski are: Combined Markov and semi-Markov processes methods along with redundancy allocation in MSSs, and Universal generating function techniques, which forms a substantial part of the book (58 pages)–describes in particular the system component importance of which is useful in the analysis of complex MSSs; statistical data processing for MSSs; reliability analysis of aging MSSs (which again forms a major portion of the book running into 47 pages) along with the provision of preventive and corrective maintenance modeling; and the concepts of fuzzy MSS, where the state probabilities of system elements cannot be expressed by crisp values. The book also discusses the life cycle cost analysis and practical optimal decision making for MSSs in order to economize on life cycle cost of MSSs. Several examples and case studies are included in each chapter to illustrate mathematical tools used in a chapter. Matlab codes provided in the Appendix of the book enhance the utility of the book, for a serious minded researcher who likes to go into depth of the study of MSS. The reviewer agrees with the claim of authors that the book is a stand alone resource on the subject and does not require any prior knowledge on the part of a reader. This feature is likely to be appreciated by beginners who are being initiated to MSS reliability analysis. Particularly, this feature will be found attractive by the practicing engineers and managers who do not have time to look around and search all the supporting resources material for pursuing the subject. The reviewer feels that book would also be found useful for researchers, students and teachers of engineering institutions as well. Review published in the International Journal of Performability Engineering, Vol. 7, No. 5, September 2011, p. 499.